Jeffrey S. Rich has trained other Pedorthists practicing in NYC and across the country. As such, other websites or orthotics you have seen may look similar to US Orthotic Center. His method is used by other labs, Pedorthists and practitioners to make custom orthotics. Here is an inside look at how your orthotics will be made. Remember all foot orthotics/orthotic inserts are made in our foot orthotic lab in NYC. Our Board Certified Pedorthist begins by reviewing any prescriptions and medical reports you may bring to the appointment. You will be asked to point out any pain/discomfort in your foot, ankle, knee, hip, or back, and the Pedorthist will ask you a series of questions regarding the pain/discomfort. During the consultation we evaluate both of your feet by taking 10 different precise measurements of your toes, feet, ankles and lower legs to determine your foot balance and health. These measurements allow us to precisely designe you orthotic inserts. We are the foot orthotic Lab in New York. 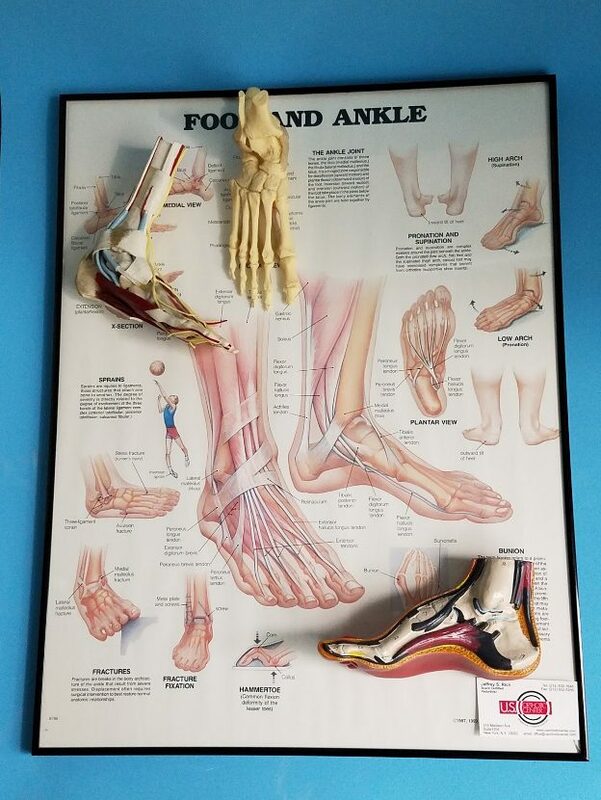 Once he examines you, the Board Certified Pedortist will explain to you, using charts and foot models, his findings and recommend which shoes would be best for your condition. You both will then go over what orthotic models would be best to treat your foot condition and outline a course of action to follow. Remember, orthotics are a work in progress and we want to work with you throughout that process. 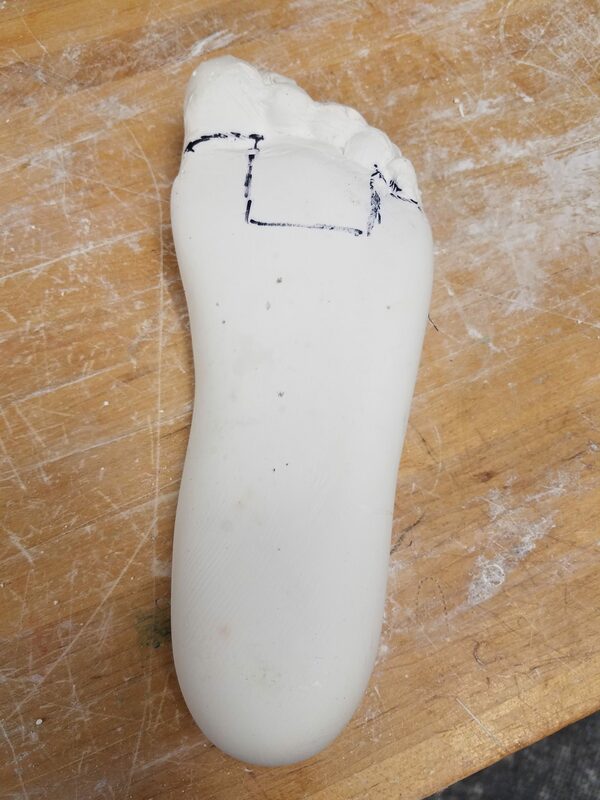 Using a special mixture invented by Jeffrey S. Rich, the Board Certified Pedorthist will align your foot, pressing it down in the gel like putty to form the negative impression of your foot. This is a reverse mirror image of your foot. Note: Jeff tried to patent the mixture in 1988, but was turned down as the mixture is used in wheelchair seats. Jeff does sell the mixture to other Pedorthists for casting the foot. 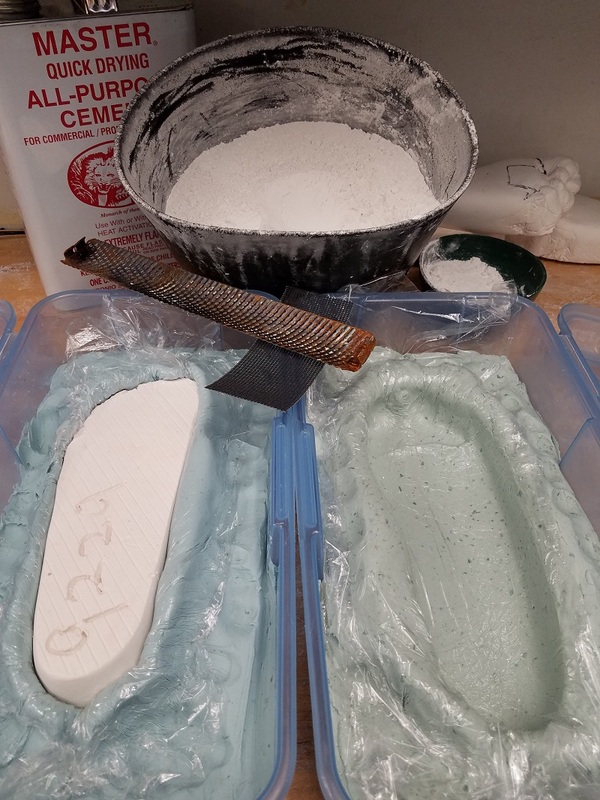 A special casting plaster is then poured in the mold to create a positive cast of your foot. This is the exact replica of the bottom of your foot. Unlike other labs, we don’t fill the arch in to balance this cast. This results in a foot mold that we call “true to cast”. The cast is then lightly sanded down to make a smooth surface that maintains its true contour. Lastly, it is then marked for correction for your unique painful areas. Next, the cast is placed into a vacuum tray. Layers of heat moldable EVA or plastic are then placed in a convection oven for even heating until the material is malleable. 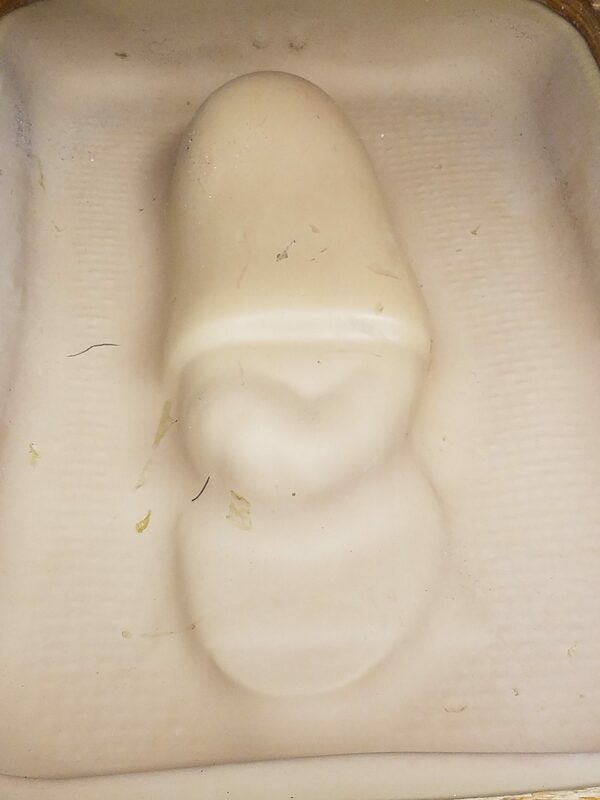 Once its malleable, the material is placed on the plaster mold and vacuumed, forming a precise mold. The material cools and is removed from the plaster mold. Grinding the orthotic is where art meets science! Using a band saw and round wheel grinder, each individual Orthotic is trimmed to remove excessive bulk and is grinded flat. Then, wedges and/or cushioned layers are added to the Orthotic to help balance your foot and alleviate your pain. All Orthotics are made on our premises. 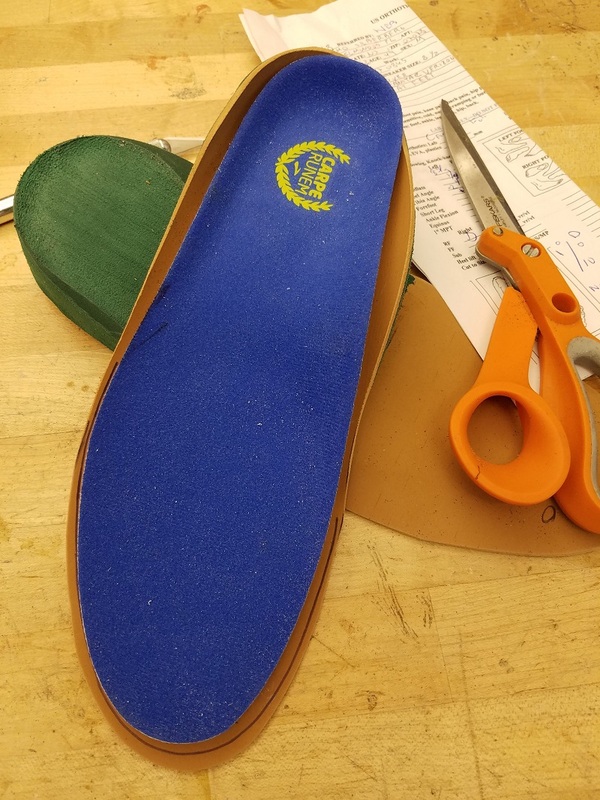 When you return two weeks later to pick up your orthotics, they will be trimmed down and interfaced to fit your footwear. The Orthotics, depending on the model, will fit into a variety of dress or athletic shoes. Remember, Orthotics are a work in progress. If they don’t fit into a particular shoe or your pain has not been resolved, you can make an appointment for an adjustment. At US Orthotic Center, your Orthotics come with 6 complimentary adjustmentsto be done within the first 6 months. Adjustments in most cases are done during your appointment. Your pain-free comfort is our goal! Jeffrey S. Rich has trained other Pedorthists practicing in NYC and across the country. As such, other websites or orthotics you have seen may look similar to US Orthotic Center. His method is used by other labs, Pedorthists and practitioners to make custom orthotics. 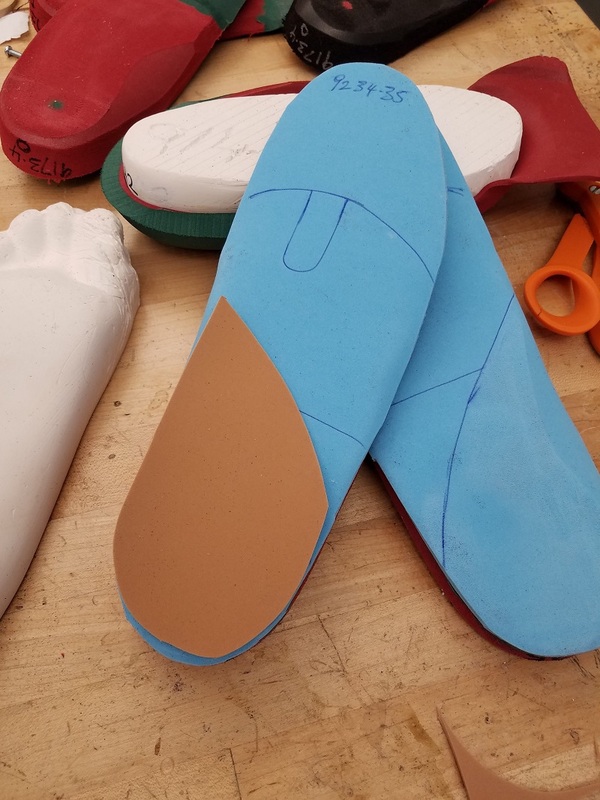 Here is an inside look at how your custom orthotics will be made. Remember we only make orthotic insert/arch support insole. We are the foot orthotic lab in New York. Our Board Certified Pedorthist begins by reviewing any prescriptions and medical reports you may bring to the appointment. You will be asked to point out any pain/discomfort in your foot, ankle, knee, hip, or back, and the Pedorthist will ask you a series of questions regarding the pain/discomfort. During the consultation we evaluate both of your feet by taking 10 different precise measurements of your toes, feet, ankles and lower legs to determine your foot balance and health.